My sabraging of a bottle of sparkling wine last night was even more fun than usual, as the person whose name was on the bottle was next to me. It was chef Michael Mina, GAYOT’s 2011 Restaurateur of the Year, in person at his restaurant Stonehill Tavern at The St. Regis Monarch Beach Resort in Orange County, CA. I had the honor of kicking off the evening’s festivities by opening a bottle of Iron Horse 2004 Cuvée Michael Mina. Posted on October 5, 2012 October 5, 2012 Author Sophie GayotCategories Dining, Orange County, Sophie Gayot, Video Interviews, Wine, Spirits, Beer & MoreTags chef michael mina, sabraging champagne, sabrer bouteille champagne, st. regis hotels1 Comment on Bring on the Bubbly! Most times I dine at a restaurant, no matter where, I pop into the kitchen at the end of the meal. I do it to say hello, to get a tour, to shoot a video, to compliment the chef, or, on the contrary, tell him or her what did not work. Even if I didn’t enjoy the experience, there is always one thing I do: I have to acknowledge the very hard work that the kitchen team puts together trying to please our palates. They work under lots of pressure, standing up during the entire service, in a noisy environment (due to the air extraction devices), most of the time in artificial light with no fresh air, and under intense heat from the stoves. 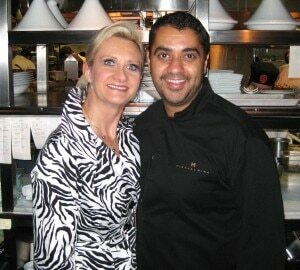 Posted on October 22, 2010 January 26, 2011 Author Sophie GayotCategories Dining, Gastronomy, Las Vegas, Restaurant Issue 2011, Sophie Gayot, Video InterviewsTags 2011 GAYOT Best Restaurateur US, aria resort & casino las vegas, chef michael mina1 Comment on Dear Kitchen: Thank You! When I went to XIV in November, I was not totally convinced by Michael Mina’s first restaurant in Los Angeles. When the names Mina and Sam Nazarian (SBE Group) are on the door, you have high expectations. Did the team sense it? What I am sure of is that they have worked very hard to create a totally new dining experience which, I feel, now works. From Michael Mina, whose eponymous restaurant in San Francisco has been one of our Top 40 Restaurants in the U.S. for four years in a row, to executive chef Steven Fretz, pastry chef Jordan Kahn and to general manger Ryan Cole, they had all realized that they could make things better, and they succeeded. Note that on Mondays, a three-course market menu is offered for $49, and that you can enjoy the restaurant’s best wines, including Château Cheval Blanc and Domaine de la Romanée Conti, at half price, for any bottle over $100. You can read our review of XIV restaurant and add your comments in our restaurant section.